Reopening the Pluto Debate: What effect should public opinion have on scientific fact? – Politics, Perception, Philosophy. And Physics. Reopening the Pluto Debate: What effect should public opinion have on scientific fact? Resolution 5A at the 26th General Assembly for the International Astronomical Union may not mean a lot to most of us at first glance. Just an afternoon of some clever people sitting in a room voting on some change of nomenclature, or maybe the classification of something most of the general population has never heard of. But this particular resolution made shockwaves around the world. As this was the motion that left us with a big change in the planetary line up. Only 8. Back in 2006 it was all any news station or knitting club could talk about. People were feeling that this affected them on a personal level. Pluto was something that we had grown up with, even though we may never go there or touch it in our own lifetime. It was something we took for granted and all loved. Yet now, 8 years later, this subject is once again on the lips of the press. Why? Because the debate is back open. 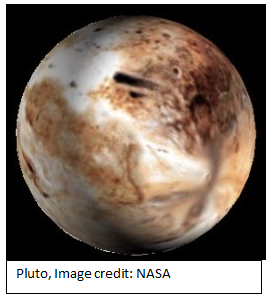 Just a simple type of Pluto into a google search bar will bring up article upon article of how Pluto may reclaim its planetary status due to a recent debate at Harvard University. The two sides in this debate are arguing over whether scientific categorisation is more important than, what has been described as, our culture. Some people believe that just because when we grew up Pluto was a planet it should always be that way. I think that this goes against what science stands for. Science is built on the idea of using facts to ascertain knowledge of the world we live in. Everything is split into categories, whether it is as broad as physics and biology, or as precise as a fruit or a vegetable. And no amount of people shouting at scientists in the street will make a tomato a vegetable. So why should this be any different. Pluto still exists. It just doesn’t fit into the category of planet. And is that really such a problem. This is not to say that public opinion does not matter. But science is not politics. It has its methods, its theories, its categories, and this is the case whether you like it or not. ← When should scientists go public with their results?